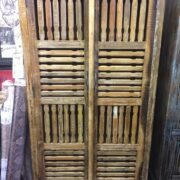 An interesting vintage glass door cabinet with both front and side panels. 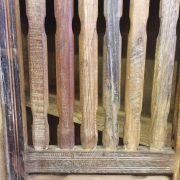 This handy sized piece of furniture is made from native Indian hardwood and could be utilised as a display cabinet. Built in Jodhpur many years ago it has been finished in a local blue colour, while some of the original wood hue can be seen. It has the added feature of an inner shelf to optimise storage options.